Pest description and damage Species identification is important as root weevil species differ in susceptibility to pesticides and have different life cycles. Adult weevils are small dark beetles with a snout (rostrum) and elbowed antennae. They cannot fly so distribution is through migration or movement of infested plants, soil or debris. The adults of most of the species are all females and capable of laying eggs. They are slow moving and should not be confused with swifter predacious ground beetles. Adult weevils are night feeders that mostly remain in the soil or in debris at the base of the plant during the day, then climb up to feed on leaves at night. 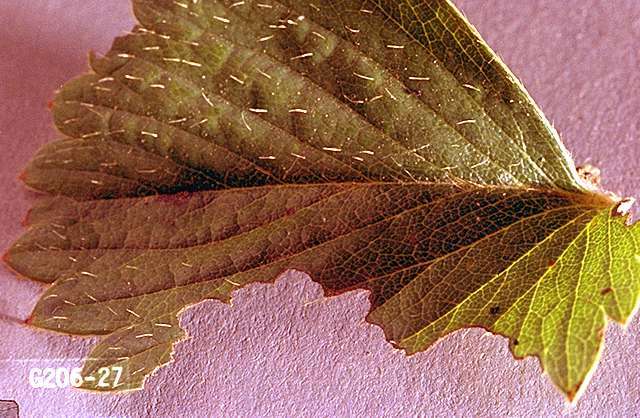 Look for ragged notches on the edges of leaves, or flower petals. Twigs of plants may die beyond where weevils have girdled the twig (salal, rockrose, yew, juniper, etc.). 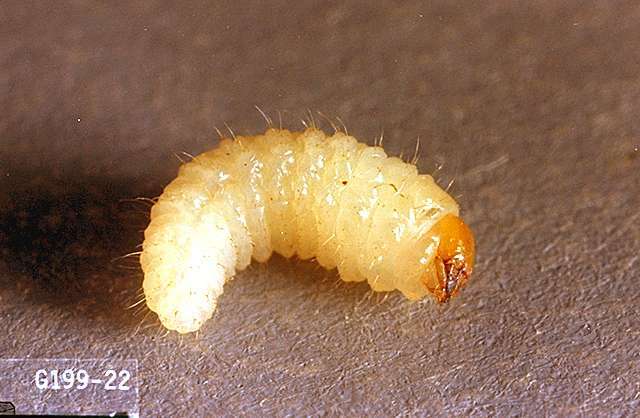 Larvae, found around roots, are C-shaped, legless, and white, or slightly reddish, with tan heads, up to 0.5 inch in size. All species are quite similar in appearance and habits of feeding on root hairs, larger roots and root crown. Check the base of unthrifty shrubs for symptoms of girdling by larvae. 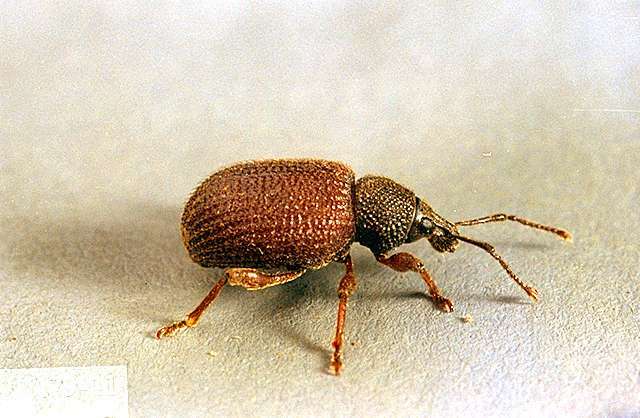 Biology and life history Adult root weevils are present in every month of the year in mild climates. Most species are abundant from May through September. Other species emerge in late summer and may be active through the winter and very early in spring in milder climates. Larvae of most species overwinter in the soil around the roots; larvae of the fall emerging species are likely to be present during the summer months. There is only one generation per year. Pest monitoring Observe leaves for fresh notching in early spring (for early weevil species). Start with visual inspection of damaged plants by day, and then concentrate nocturnal flashlight searches, just after dusk, in those areas. Weevils can also be dislodged onto a beating sheet, or pizza box, at night or captured in pitfall traps. Several newly developed traps for trapping adult root weevils are available as a monitoring tool. Inspect unthrifty plants for missing roots, root hairs or for small white, C-shaped grubs. 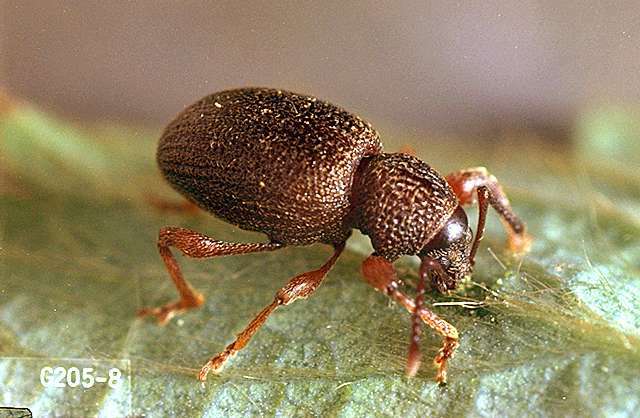 Root weevils are inconsistent in their damage to landscape plants: there appear to be sun/shade influences, host and cultivar preferences, based on physical and chemical characteristics of plant genera, species and cultivars. (See Antonelli for list of susceptible and resistant cultivars). Cultivation of the soil in April-May can eliminate overwintering larvae before planting. Use a cereal cover crop to disrupt weevil numbers, as small grains are not a recorded host for root weevils. Hand-pick adults when found. Several parasitoids have been reared from some of the species of root weevils: at least two tachinid flies and one braconid wasp. Good control was obtained by placing shredded oak leaves under plants to encourage ground foraging birds. Beneficial nematodes have shown some effectiveness in controlling larvae when applied as a drench as the label directs. Nematodes must be placed in the root zone where weevil larvae are; the soil must be moist and the soil temperature above 55°F. Nematodes are available at some garden and nursery stores and through mail order.